In this age of text-speak and abbreviations, it is quite common for emails to drift into an informal format. When messaging your friends or family, this is completely acceptable; however, it can easily lead to a lazy style of emailing when contacting organisations. This can infer that you don’t care, or be taken as rudeness, and you certainly do not want those connotations within your professional life. This article highlights the key things to remember when writing a professional email. If you follow these rules, you are less likely to make an error in an emailed job application, when contacting organisations, or when sending an email for work. Following the simple rules below will ensure that your emails always represent you in the most professional way. It can be helpful to think of an email as “electronic mail” and, as such, a letter, and therefore to format it accordingly. A professional letter will always contain an addressee, will be checked for spelling mistakes and grammar, and will use the correct closing to sign off. By ensuring that you include these elements and check that the content is correct, you will ensure that your emails come across as professional. 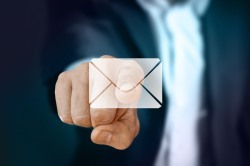 When starting emails, it is vital that you always include an addressee. If you know the name of the recipient, then state, “Dear Barbara”. If you do not know the recipient’s name, then you can choose to start by saying “To Whom It May Concern” or “Dear Sir/Madam”. The main thing to remember is that an email should not just start by going straight to the subject matter. Non-formal abbreviations do not have a place in formal emails. Text-speak is becoming more and more widely used, but a professional email should never contain this informal language. For example, BRB, B4, cheers, etc. should not be used in an email. The key thing to ask yourself is whether your email sounds formal. If the answer is no, then you should re-word it. Spelling errors are a common feature of an informal email. However, when you send a professional email containing a spelling error, this reflects badly not only on you, but potentially on the business for which you work. If you are working as a Legal Secretary, it is important to remember that the field in which you work is one which requires a large element of trust from your clients. If they see a spelling error, they may question the attention to detail which is applied to other areas of your work. Although a spelling error in itself is largely not an issue, it is the inattention to detail it represents that can cause concern. The use of correct grammar and punctuation within emails not only shows your capabilities, but also makes the content easier to read and prevents any misunderstandings. Omitting capital letters, especially at the beginning of a sentence, suggests laziness and in turn can infer that you don’t care about the recipient of the email or the subject matter in question. It is important to remember that tone is not conveyed as clearly through the written word as it is through speech. In informal written text these days, individuals will often convey tone using an emoticon. However, this is not acceptable in a professional email. It is therefore important that you read and re-read any email you are sending. Consider whether the person reading it could interpret it in a different tone/way. If so, it is better to make corrections before hitting the send button. Finally, it is important to always use a formal closing when ending your emails. Using the correct “Yours sincerely,” “Yours faithfully” or “Kind regards” before writing your name at the end of the email shows not only that you are treating the email as a formal piece of writing, but also that your knowledge of grammar is correct. Overall, it is important to remember that an email presents you, your attitude, skills and knowledge to another individual. When writing professional emails, you need to be presenting the most professional version of yourself and by checking the email etiquette mentioned above, you should ensure that you never make an email-etiquette error again.